Andre Payne grew up on the mean streets of south central LA where he learned early on that only the toughest survive. And survival meant joining one of the ruthless gangs that control the streets. Andre never knew his father but when his life of guns and crime catch up with him, his dad finally shows up. And Andre’s about to realize the shocking truth that he’s the modern incarnation of the demigod, Hercules and his father is the powerful Zeus! Zenescope re-imagines yet another age-old tale for a new generation of readers! Don’t miss the first issue of the series that introduces the Grimm Universe’s greatest new hero! 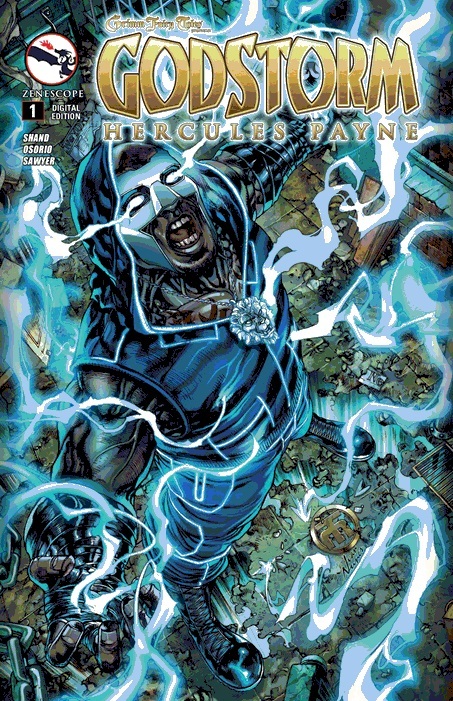 Cover-Killer logo at the top, Hercules Payne gets the bulk of the cover space with blue lightning crackling all about him. A lion’s head medallion around his neck and a golden runic symbol at his feet, it’s very detailed and quite visually striking. Romance– Andre seems pretty clueless that Karina has the “hots” for him. Their potential romance and putting her in danger as a result adds even more weight to the already emotionally charged introductory tale. Socialization– It’s often said that children live what they lean and this issue is one I could throw at my sociology class and ask them why Calvin and Andre turned out so differently despite sharing the same mother and home. The impact of not knowing ones father and the need for male approval may have lead Andre to the local gangs where male approval or the impression of male approval was given etc. As I said this would be a sweet issue to analyze in my college class in the upcoming semester! Black Hero-Introducing Hercules Payne a modern re-imagining of the classic Greek demigod Heracles/Hercules. In the same vein as Watson and Holmes from Bollers, Mendoza and Leonardi. Family-It was quite emotional watching the strained exchange between Andre and his brother Calvin. Even more painful and heartbreaking were the last two pages as Calvin dies in front of his brother. Also the ramifications of what that news will do to his mother are probably even more devastating. We also get hints as to the makeup of the family. Calvin is the older more responsible brother; he knows who his father is. Andre meanwhile is the directionless younger brother still living at home with his mother and trying all the wrong things to take care of them, and aspiring to “Manhood”. Andre also has his surrogate family “his boys/his gang” his brother’s profession puts a strain on these relationships. Andre is often pulled in two very different directions by the social expectations of each “family” group. Story– Andre is having lunch in a diner served by Karina. His brother Calvin shows up and tensions mount. Elsewhere drug lord Terrell Taylor roughs up the competition while being romanced by the Greek Goddess Venus. That night Calvin gets shot at a drug bust involving his brother Andre. Buy It-What’s that? Black books don’t sell? Time to put out or shut up! If you like it Buy it on comixolgy! Interior art– Not as strong as the covers and this may put off the average reader. Race swap– Some fans are very pessimistic and can’t see the value in changing the race of a character. If your one of those then this will not change your mind if Batwing, Miles Morales/Spider-Man, Steel , Icon, or Watson and Holmes did not before. Criminal– In the age old tradition of Luke Cage we have yet another black man being a criminal. If that kinda thing pisses you off, you best stay away! ← Miles Morales Joining the All New X-men!